The history of "Xhol" is not that well documented. 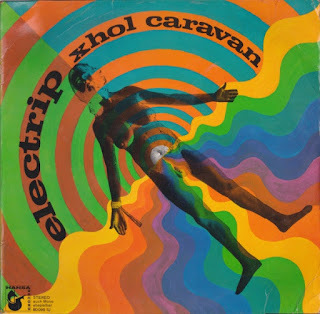 Though we do know that they originated in the mid-1960's as "Soul Caravan", changing name in late-1968 to "Xhol Caravan" after playing at the Essener Songtage. This new name heralded a more progressive blend of new ideas, and the developing their sound with a big conceptual opus now documented on disc 1 of the 'Motherfuckers Live' set. Still finding their feet, and moving on "Xhol Caravan" debuted with a single in the vein of 'Shades Of Deep Purple', still soul-edged but much more progressive. Though, it never hinted at all at the album that was to follow a few months later. In 1969, on the little known Hansa label, "Electrip" was released to an unsuspecting public. "Electrip" was one hell of a remarkable album, especially for the 1960's, an electric saxophone and organ fronted fusion (kind of classic "Uncle Meat" jamming Zappa territory) with a great deal of invention and energy, hinting at later records by 'Nosferatu', 'Faust', et al. The album starting with a toilet flush, blasts away with "Electric Fun Fair". "Pop Games" and "All Green" continue along this path with the same optimistic melodies and insouciant demeanor. On the 17 minute "Raise Up High", the instrumental sections are very similar to the previous side, but here they added some wild English vocals to the mix giving the song a rough hard rock feel to it. The album is full of surprises and unlikely diversions, dazzling studio trickery and humour amongst its features. Remarkable throughout! Whether they existed much beyond this, we don't know. We do know that the band name led to some confusion, and the name was shortened to just "Xhol". Out Of Focus ‎– Wake Up!